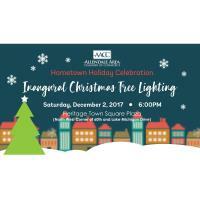 Allendale, MI – On December 2, 2017, the Allendale Area Chamber of Commerce is hosting the Hometown Holiday Celebration and Inaugural Christmas Tree Lighting in Heritage Town Square Plaza (Northwest corner of 60th and Lake Michigan Dr.) from 5pm-7pm. The Christmas tree lighting will take place at 6pm. Join in free, family fun activities hosted and sponsored by Allendale Chamber member businesses throughout the plaza. Enjoy visiting with Santa Claus, hot cocoa and Christmas cookies, crafts, face painting, a North Pole call center, photo booth, food trucks and more. There will be opportunities to donate at this event. Snap Fitness will be accepting new and gently used boots and shoes and Rikes Lawn Care will also be on site accepting non-perishable food items and personal hygiene donations for the APS Homeless Awareness Program. In addition to Hometown Holiday Celebration in the evening, there will be family friendly holiday activities happening in Allendale all day. Main Street Pub is hosting a Breakfast Buffet with Santa from 8am to 10:30am, Saturday with Santa will take place at the Allendale Public Library from 11am to 1pm, as well as the Artisan & Craft Market Place at Allendale High School from 9am to 3pm. A big thank you to all of the sponsors and hosts for helping to make this event possible. For additional information about the activities and a complete list of sponsors, please visit http://www.allendalechamber.org/hometown-holiday-celebration.